Long break: A file photo of employees striking work at Maruti’s Manesar plant. India’s largest car maker Maruti Suzuki India Ltd has lost an estimated ₹ 540 crore in revenue in the past two months because of labour unrest at its Manesar facility, company officials said. The disruption of work has led to a loss in production of about 12,500 cars in September, resulting in a revenue loss of at least ₹ 360 crore. In August, the company produced 6,000 cars less than its target when workers deliberately slowed work, resulting in an estimated loss of ₹ 180 crore. In a notice to workers in August, the company said that “even upon calling off the stay in strike, which was illegal, the workmen did not restore normalcy". Such activities, the company said, took the total production from the plant to as low as 96 units on 24 August compared with an average daily production of 900 units. An analyst with a leading brokerage firm said that the company’s profit may be reduced by at least ₹ 40 crore because of the labour trouble during the past two months. “In the same quarter last year, Maruti’s margins were at least 10.5% and that is likely to come down this year due to a fall in the volumes," said Nikhil Deshpande, an analyst with Mumbai-based Brokerage PINC research. “So, this will have an impact on profitability." The company’s profit may not get affected because of the strengthening of the yen against the Indian rupee as it is hedged till the second quarter. However, the expenses that the company has saved by not paying salaries to employees during this period may bring in some respite. Maruti’s labour cost is at least 2% of its net sales. 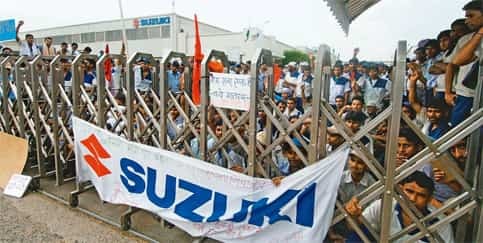 The latest developments at the Manesar factory are a continuation of the labour unrest that started in June, when workers struck work for 13 days demanding the recognition of a new labour union, the Maruti Suzuki Employees Union. During this period, i.e., in the last quarter, the company had lost ₹ 340 crore. Production at the Manesar factory of Maruti Suzuki was hit after the company said it would only allow workers who had signed a so-called “good conduct bond" to work, citing indiscipline and sabotage by workers over the past two months. The move hit production of the new version of the popular Swift, which got 100,000 bookings in around one month after its launch on 17 August. The production of other cars such as the A-Star and the SX4 also took a hit. According to Bloomberg data, 30 brokerage firms have recommended a buy on the stock, 18 have urged a hold and 10 have asked investors to sell. Brokerage firms such as Kotak Securities, Ambit Capital and Brics Securities have downgraded the stock in the last two weeks. The company’s prospects are still robust, said Yaresh Kothari, sector analyst with Angel Broking Ltd. The brokerage, which had downgraded the stock in the first quarter, will continue to recommend a hold in the third quarter. “We believe interest rates will be corrected in the first half of next year and then the volumes will bounce back," said Kothari. “We expect the company to grow at 12% next fiscal, which will be a good growth rate considering this year’s drastic fall."